I volunteered at the Houston Zoo for a number of years, and I worked with the orangutans. But I was always fascinated by the elephants, and when I’d finished with the orangutans I’d stop by their exhibits and watch what their keepers were doing to keep them in good health. I went by so much that the keepers realized I was really interested in the elephants. And they let me get closer and closer, and they trusted me. So.. it’s 4 o’clock in the morning, and my phone rings, and it’s one of the elephant keepers. And she says, “I think you’ll be interested in what’s happening. Come on down to the zoo.” I got there in 5 minutes and managed to put my uniform on. And one of the females had just self-aborted a fetus that was probably 80% to term. The fetus probably weighed about 100 pounds, and she was destroying the fetus in the exhibit. And it was violent and it was shocking, but because it was animal on animal it did not bother me. We watched what she did to destroy the fetus. They asked me to help clean up the exhibit while they closed it for the day, because they did not want the public to see it. I returned to the zoo that night to tell stories to families that come to the zoo at night, and when I finished doing that, I got on a golf cart and drove around the zoo on this beautiful full moon night - the zoo is done on a circle. And as I got closer and closer to the elephants, I heard a sound coming from the elephant exhibit that could only be described as a wailing. I’ve never used “wailing” in a sentence - I’ve only seen it in a book. And as I drove the golf cart up on this Jurassic Park-looking exhibit, I looked down, and there was the mother elephant on her side, with her trunk perfectly perpendicular to the ground, and the noise I was hearing was coming out of her trunk. 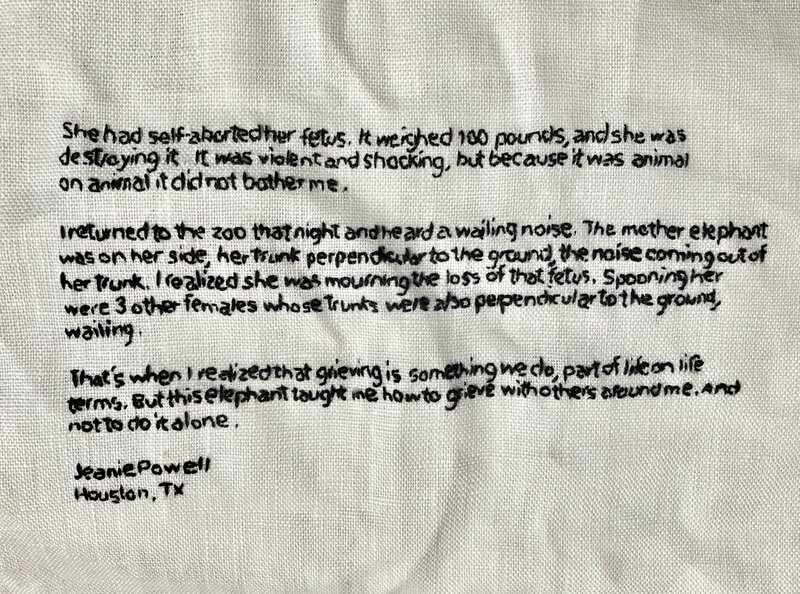 And I realized with the lights of the golf cart on her, first of all that I… did not want to be there - I felt like I’d invaded her space - and it felt voyeuristic…but I looked and I realized that she was mourning the loss of that fetus. And as I got a better look, and my eyes adjusted, I saw that, spooning around her, were 3 other female elephants whose trunks were also perpendicular to the ground, and they were also making the wailing noise. And that’s when I realized that grieving is something that we do. It’s another part of life on life terms. But this elephant taught me how to grieve with other people around me. And not to do it alone. And it was a wonderful lesson - to learn that important part of life’s process, with it being life on life’s terms.